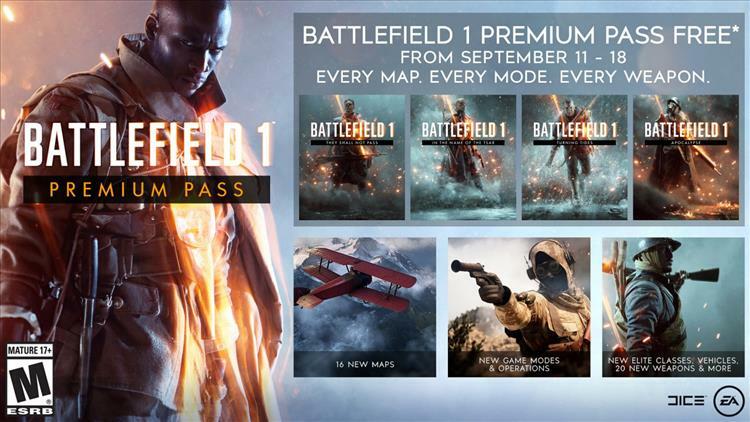 As announced on EAs website, the Premium Pass for Battlefield 1 is going to be free for the next week, from today through September 18th. But to take advantage of that you have to have a copy of the game. Well lo and behold, sales abound. Battlefield 1 is on PC via origin for 5 bucks, on PS4 via the PS Store for $5.19, and on Xbox One via the marketplace for $6. Each of those offers sit next to premium pass editions that will include the (now) free DLC. So there is really no reason to shell out the extra bucks, at least not this week. Battlefield 1 is another installment of an excellent series known for a good story mode and intense, large scale PvP. This one tracks back to the brutal combat of World War 1 and pulls no punches. We gave it a 9 out of 10 when it released about 2 years ago, with similar ratings for the DLC.